Welcome to Umwelt-Technik Ltd. web site! Download our catalog in PDF format! Umwelt Technik Ltd. was founded in 1990. In the beginning, we were engaged in the cleaning and complete disinfection of pipes and the installation of a new pipe system. The scope of our activity was greatly expanded when the Austrian company, Rabmer GmbH became a co-owner of our enterprise and helped the works with new technologies. 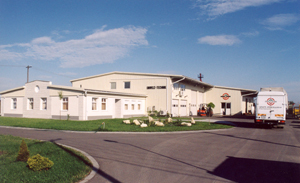 As a result, in 1991 application of the processes CF-Liners, Process R.tec was introduced in Hungary. Our processes have been expanded through continuous development, in line with the requirements of our clients. We offer a wide spectrum of services, ranging from the inspection of pipelines to renovation. Efficiency is guaranteed by the high technical standard of the processes, the experience of our expert personnel and the quality assurance system. Umwelt-Technik Kft. is majorly owned by the Hungarian Olajgép-Tec Kft and it is a member of the Austrian Rabmer Group and the Japanese Sekisui Group; therefore, we are able to rely on the experience of the group gained in Europe. We offer a wide range of processes for pipeline inspection, cleaning and trenchless renovation. Our advanced premises constructed in Kerecsend provide proper conditions for the preparation of our work, and the storage and maintenance of our equipment and materials. Our objective is to offer our clients the most suitable processes to solve their pipeline problems. An important aspect of our work is to get acquainted with the problems and special renovation requirements of pipeline operators.